Once again the Mountain Hut Charity Tea Shop at Ruthwaite Lodge will be opening on Easter Saturday & Easter Sunday to raise money for Macmillan Cancer Relief. See our What's On listing for full details. Our local Housing Group have published the results of the recent Patterdale Parish Housing Need survey, and have issued a press release outlining next steps. Go to our Affordable Housing page to see a summary of the results & read the press release. Click here to see a full copy of the Housing Need survey report. 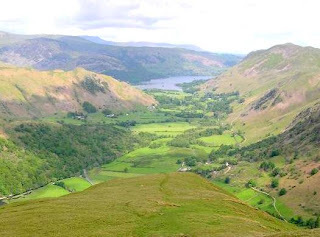 The Friends of the Ullswater Way have organised a series of evening talks on the first Thursday of the month, starting April 4th. The talks are designed to give an insight into the cultural and natural heritage of the valley. There are an additional two talks in September to coincide with the Ullswater Walking Festival. The talks are free - light refreshments are available. See our "What's On" listing for details of individual talks & venues. The National Trust are keen to recruit volunteer "Day Makers" at Aira Force. The Day Maker "will meet and greet visitors to Aira Force and will use an enthusiastic knowledge of the local area to provide any information that they may require." Click here to go to the National Trust webpage for more information on the opportunity & how to apply. Openreach have now completed the work to bring fibre to Hartsop and is now available for local premises to order. Judging from experience elsewhere, some Internet Service Providers may take longer than others to wise up to the new fibre availability, so may need prompting. It's important to remember that you have to order the new fibre broadband service from an Internet Service Provider - you will not be automatically upgraded. Click here to check what service is available to your house. Click the Button is back and better !! Now that most of the parish can sign up for super fast fibre broadband, it will be interesting for everyone to see the kinds of speeds people are getting or can expect to get if they sign up for the service. See the results so far. BroadbandUK have provided us with a bespoke speed tester, which is much quicker and easier to use. Help us to get more measurements by asking friends and neighbours to click on the 'Red Button' above and let us know the result. We don't mind how many times you run the test. The two new installations are not Gillian and Tom at the Patterdale Post Office. One of the new installations is a plaque at the Post Office to mark the very first shop to sell copies of Alfred Wainwright's guidebooks to the fells. The second installation is a slate sculpture along the Ullswater Way under Arthur's Pike.The installations are part of a series commissioned by the Friends of the Ullswater Way. Click here to go to the Friends blog for the full story and lots more pictures. Patterdale School is concerned about motorists driving at speed past the school. Danielle Ousby, our local Police Community Support Officer, has got in touch with Patterdale Today asking us to highlight the issue - Danielle says that "other measures" are being looked into but the message is clear - Please don't speed past Patterdale School! The Public Hall is already getting booked up for 2019 - the advice is to make your booking now to avoid disappointment. Contact Michelle Edgar on 01768482332 to make a booking. Click here to read about a new project promoting sustainable travel into Cumbria and the Lake District. Local charity "Cumbria Action for Sustainability" (CAfS) is offering to supply and fit free draughtproofing to qualifying Eden residents. You may qualify under three criteria - over 60 years old and on a low income, under 60 and in receipt of a means tested benefit, or a member of the household has a disability or long term health issue. To learn more ring CAfS on 01768 861 463, or click here to visit their website. You can now give online feedback on your experience of any NHS service in Cumbria and read reviews posted by others. Click here to visit the website, which has the full support of all health providers in Cumbria. The Penrith Players, a renowned local amateur theatre company will perform a collection of very short plays - mystery, musical, comedy, drama - at Glenridding Village Hall on Monday April, 15th at 7.30pm. Doors open 7pm. £5 admission ( includes a drink from the bar). The National Trust, working with partners including the Environment Agency, Natural England and Cumbria County Council, has developed plans for a new Ullswater Rivers Scheme. The scheme aims to reconnect rivers with their floodplains, resulting in improved flood resilience, water quality and habitats. A planning application for the first phase of the scheme was submitted on the 25th January. This project will move Goldrill Beck away from its current course alongside the A592 by re-meandering the river across the floodplain. The National Trust sees this as a great opportunity to work with nature to make the valley more resilient and allow new opportunities for nature to flourish. For regular updates about the scheme Click here to access the "Restoring Ullswater's Rivers" page on the National Trust website. "In November 1918 Hedley Grenfell climbed Helvellyn 19 times in one week to celebrate the end of the war. A bonfire was lit. 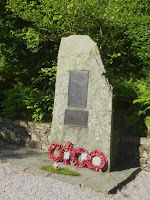 He now lies in Patterdale churchyard"
His nephew, Harry Grenfell who was born in Hedley's cottage in Glenridding, had been wounded in the Battle of the Somme but thankfully survived the war. His name appears on the Roll of Honour, click here for more details. Many thanks to Hedley Grenfell-Banks who sent us this photo with a note "Hedley Grenfell was my grandfather; his work at Greenside mine explains his presence in the dale at this time"
2019 Ullswater Calendar is available from Betty Jackson (07900 134334 or bettyhomefield@gmail.com) or from Patterdale Village Store. £7.99 if you can pick it up yourself or £10.00 for calendar and P&P. Cash, cheque (payable to Glenridding Public Hall) or bank transfer (see Betty!). We have added some links in the Local History section of the site, to zoom-able images of several old 6 inch Ordnance Survey maps of the dale. They cover the years 1859, 1900 and 1913. Click here - they are fascinating to look at. ACT (ACTion with Communities in Cumbria) has produced individual Parish community profiles based largely on data from the 2011 Census. Click here to see the Patterdale profile. Eden & South Lakeland Credit Union is a not-for-profit community organisation owned by its members. Click here to go to their website and learn how to join and get details of the saving & borrowing opportunities on offer. To check out what's on at our local cinemas and theatres, click above to access the Links Page. A new website has been launched to promote Penrith . The website is an initiative from the Penrith BID (Business Improvement District) project - click here to visit the new website. A few years ago, we were delighted to receive, from two readers, quite a selection of Joseph Lowe photographs showing how the dale looked around a hundred years ago. Some of these images have been added to our Then and Now gallery alongside a photograph of the same scene today. If you can help to date any of the pictures or suggest any narrative for them, please e-mail the editors. Eden District Council are now offering to microchip dogs for Eden residents for free. Click here to learn more. We continue to add new items to the popular Local History section of this website. We also believe that we have solved the mystery of G R Bennett on the War Memorial. The large collection of transcriptions that Chris Darvill has made over the years, such as the Parish Registers, Directories and Census Records, will be of interest to Family Historians. All of the graveyard memorials have now been transcribed and photographed by Chris. Cumbria Fire & Rescue Service have launched an online self-assessment survey enabling residents in Cumbria to gauge their risk of falling victim to fire in the home. Click here to access the online assessment. Did you know that a Prince of Wales spent two nights in Patterdale? See our Timetables page for new bus and rail timetables. The Lake District Mountain Rescue Search Dogs Association 2019 Open Day is on Sunday, May 19th from 11am to 3pm at Kirkstone Pass Top car park. There will be serach dogs working on the slopes of Red Screes. See our "What's On" listing for more details. Eden District Council has been awarded £938,640 from the government’s Community Housing Fund. The money granted from this Fund aims to create more housing in areas where the impact of second homes is particularly acute and housing prices outstrip local household incomes. Click here to read more on our Affordable Housing page. There is a new free national helpline to ring to report a power cut or receive reassurance during a blackout. In Cumbria, dialling 105 will put you in touch with Electricity North West, which is the company that manages the cables,power lines and substations that deliver electricity into homes and businesses in Cumbria. The Environment Agency has published a Flood Action Plan for Cumbria - "Reducing Flood Risk from Source to Sea" - (click here) and separately a Glenridding Community Action Table (click here).The purpose of their Glenridding Community action table is to highlight the flood management that is currently in place and the specific actions that are happening or proposed within the Cumbria flood action plan for the Glenridding community. Our own Patterdale Parish Community Flood Plan is published on our Patterdale Community Flood Group website (click here). Our dale has a private email list which is used to provide information straight to your inbox about any topics of interest relating to the parish of Patterdale. Click here to go to a news article on the council web site which provides more details and who to contact to be included. Don't forget also to write to us at patterdaletoday@gmail.com with details of forthcoming events so that we can include them in our "What's On" listing. The Patterdale Parish Community Flood Group now has a dedicated website - click here to access the website and read about recovery/resilience plans for the parish. The Parish Council website is posting day by day updates on flood recovery activity in the parish, support available etc. Click here to access the Parish Council news page. Cumbria County Council have produced a Flood Factsheet for Eden District . The Factsheet has regular updates on flood recovery, road and bridge closures, links to other info etc - click here to access the Factsheet. 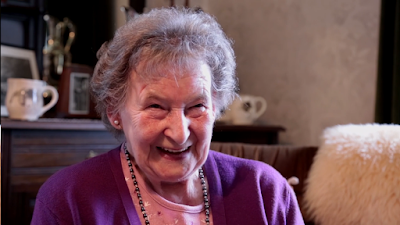 Matt Sharman has created a short film featuring a number of local residents whose portraits were in the recent exhibition at Dalemain, including Rosie Lightfoot (below) - click here to view the video. If you do, click here to go to our list of lots of volunteering opportunities. Although there is an Eden-wide recycling scheme (click here for full information on the scheme), it is still beneficial to the community to make use of recycling centre in Glenridding. The more people who use the recycling centre in Glenridding the more money the parish council earns to spend locally. If possible please encourage people to use the centre even with the box and bag scheme. Please remember there is no general rubbish facility in Glenridding.